Open the Home view. On the Home tab, click SureBackup Job > Hyper-V on the ribbon. Open the Home view. In the inventory pane, right-click SureBackup under Jobs and select SureBackup > Hyper-V.
You can use this method if you already have at least one SureBackup job. If there are no SureBackup jobs, the SureBackup node will not be displayed in the inventory pane. 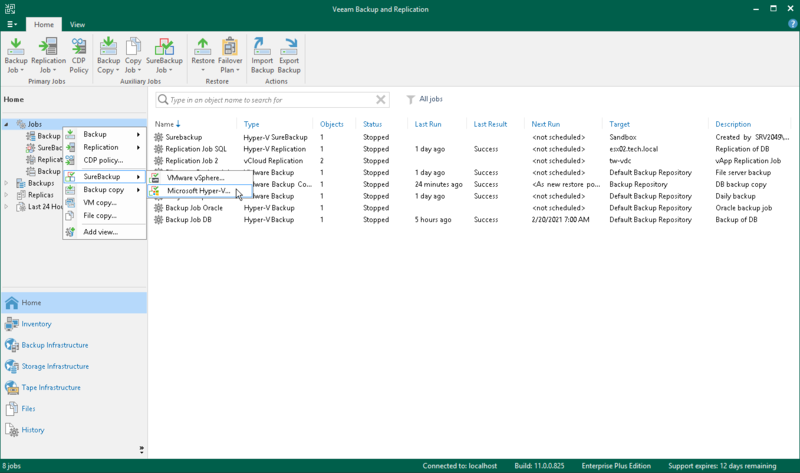 In this case, you can right-click Jobs in the inventory pane and select SureBackup > Hyper-V.
SureBackup UI elements become available in the Veeam Backup & Replication console only after you create or connect a virtual lab. For more information, see sections Creating Virtual Lab and Connecting to Existing Virtual Lab.